A journey today short in distance but long in emotion. After a good breakfast we set the “Auschwitz” waypoint in the GPS, selected “shortest distance” and set off not really knowing what to expect. We arrived shortly afterwards at the camp/museum where a very helpful car park attendant showed us to park in a paved area. Not only that but the attendant also allowed us to stow our helmets, coats etc in their little hut. Great! We seemed to be the only bikers there although there were already a number of coaches disgorging their contents when we arrived. We entered the museum (actually this was the original Auschwitz I camp) which, together with the nearby Birkenau (Auschwitz II) camp are free to enter. For once we decided to join one of the organised tours (we don’t usually do this – preferring to wander round on our own, but here we thought it might be a good idea – it was!) for 49 Zlotys each which included a set of headphone and radio thingy for listening to the guide (there was a 10 Zloty refundable deposit for each set). 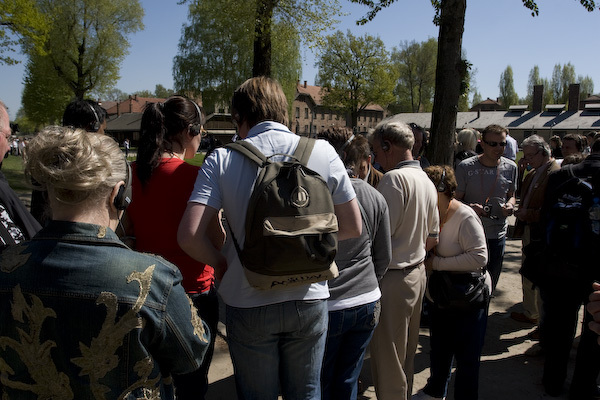 The tour was about 3 hours long and includes both Auschwitz and Birkenau and the shuttle bus between the two camps. The best time to visit seems to be early morning or latish afternoon when it isn’t so busy. But, to be honest, anytime is OK as long as you don’t mind lots of people. A lie if ever there was one! Anyway our group was about 10-15 people. We all gathered around our guide, David Kennedy and off we went. And thus started one of the most emotionally draining journeys I have ever been on. No ‘draining’ is the wrong word – to negative, ‘intense’ is probably better but still not 100% correct. Whatever the right word is it was a journey of the soul, a difficult journey but one that needed to be made. We went in under the famous sign that everyone has probably seen. Interesting to see it in real life though. And then in and out of the barracks at Auschwitz I seeing various exhibits, photos etc. This was all harrowing enough but then we came to the exhibition of the inmates personal effects. Firstly we saw two tons of human hair which was sold to make textiles. This brought home, to me, the fact that the camps represented an industry of death. We then saw an exhibit of peoples glasses. Each represented a person. Then there were artificial limbs and looking at them made me realise that the people who owned them got off the trains bringing them to the camp and went straight to the gas chambers because they were useless for work. We then came to two exhibits that really got to me. The first was the luggage of the people who were sent to the camp. The majority had the person’s name, date of birth or address on. This was, I think, where they became real people to me not just photographs or records. There was the suitcase of a person born in 1909 and the link to my father (born in the same year) sprang to my mind like a cold shock. Then came, for me, the saddest, saddest exhibit – a large quantity of childrens shoes. I had read of the adult shoe exhibit which is terrible but this is far far worse. These children, like the limbless, like the old and infirm, like the diseased, were, in general, sent straight to the gas chambers from the incoming trains. How, how can you destroy your own humanity that completely so allow you to accept the deaths of children? There were shoes there that would fit my two year old grandson. How? Please someone answer this question for me because I don’t and can’t understand! Terrible, utterly utterly terrible. From there we went to the “Death” barracks (Barrack #11) where summary courts were held by the Gestapo (Usual sentence? – death by shooting). Prisoners found guilty (most of them) were taken from the court to a room in the same building where they were bathed (one room for women and one for men) before being taken naked outside via a narrow corridor. They were then shot by the guard who escorted them. What sick, perverted mind thought that one up? Bathing the prisoners before shooting them – did it make for a cleaner corpse? We also saw the starvation cells where prisoners were locked and allowed to starve to death (a ghastly long process and if they weren’t dead after that they were given a lethal injection to the heart), the cellars where gassing was originally trialled on 850 sick prisoners (they took about 20 hours to die – that is the stuff of nightmares made real. They also used “standing cells” which are small (telephone box sized) cells that held 4-5 prisoners. They couldn’t do anything but stand. They were put in these cells at night and expected to work during the day just like the other prisoners. They could be put in these cells for anything from three days to weeks. Eventually the longer term inmates of these cells died of exhaustion. 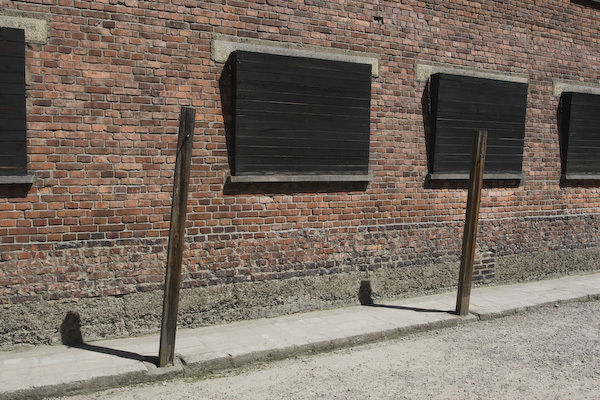 The courtyard where the shooting took place also held two posts with a hook on each. Prisoners under punishment were placed on a chair with their arms tied behind them and also to the hook. The chair was then knocked out from under them. Their whole body weight would have been taken on their arms and shoulders which would have been wrecked. They would then have been unable to work and therefore sent to the gas chambers. This barracks also had a portable gallows. What mind could think of such a thing? We also saw the commandants house (and gallows where he was executed by the Poles in 1947) and the single crematorium/gas chamber that they had in Auschwitz I. These are so close to each other. He (Rudolf Höss) and his family lived less than about 50m from the chamber. How could you? 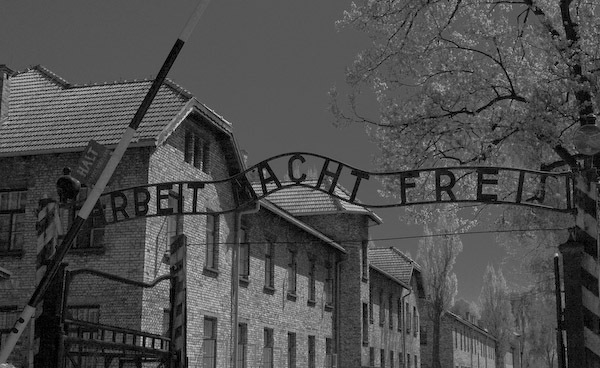 Just one of the horrors of Auschwitz – and there are so many: From the sick joke at the front gate “Arbeit macht frei” to the idea of an orchestra playing every time the inmates left or returned exhausted from a days work. 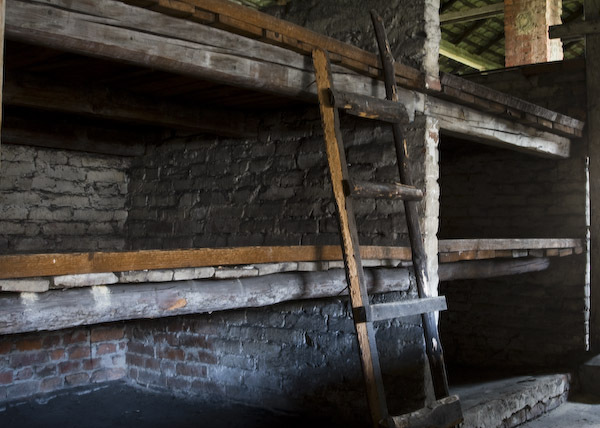 After the emotional ride of Auschwitz I the short shuttle bus ride to Birkenau was a relief. 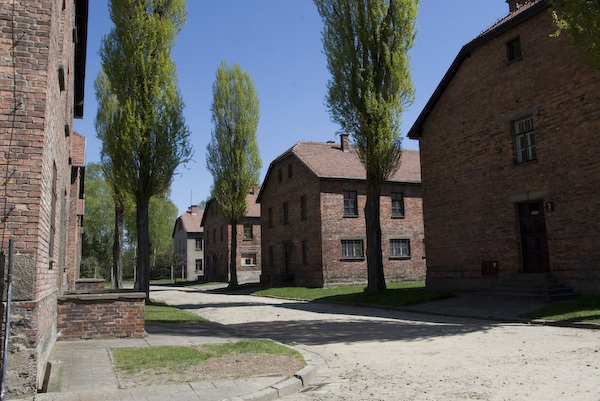 Birkenau is, of course, the camp most people think of when the name ‘Auschwitz’ is mentioned. With the rail line, the main gate it is, if you will, somewhat iconic. 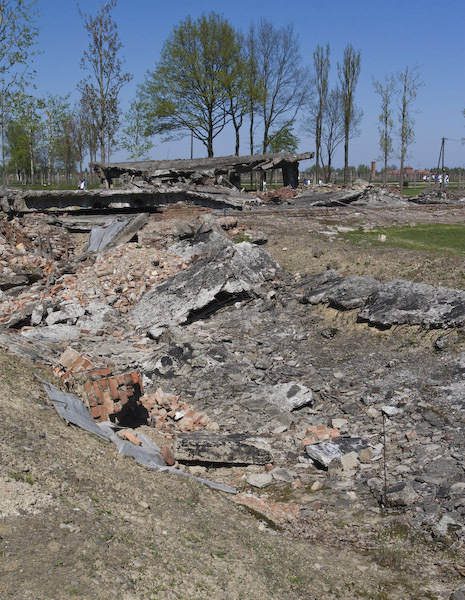 The first thing that grabs you about Birkenau is its size. It is big! The second thing, strangely, is the organisation. There was a lot of thought and planning that went into it. Then you look past all that and the human tragedy that it represents hits you. 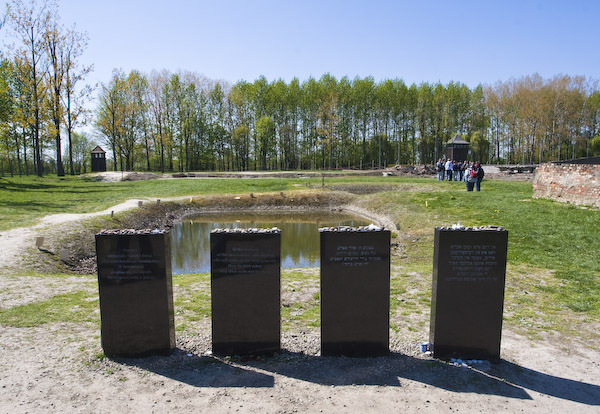 Between the three Auschwitz camps there were about 1,100,000 people killed in four years! Looking at the remains of the gas chambers/crematoria the sheer scale of the operation is evident. 2000 people at a time could have their lives extinguished. A process that too between 20 and 25 minutes. Think about that – unlike in Hollywood movies they did not die instantly – A terrible process in itself – but had to go through 20-25 minutes of slow choking asphyxiation. A death of such primordial horror for me personally (I had bad, almost fatal, asthma as a child). Looking into the ruins of the changing and “shower” rooms you can almost hear the souls scream out at you across the intervening years. Then the ash pits where the cremated remains were thrown. Two are now ponds. These are the same ponds that entered my consciousness thanks to Jacob Bronowski all those years ago. Being here does not assuage that memory but rather enhances it and makes it so much more personal. We saw the barracks for the inmates with their oh so familiar box bunk beds. I could just imagine people fighting for the top bed which represented better conditions and chances of survival. Even today, one of the hottest we have had so far, the barracks were cool. They must have been absolutely freezing in winter. no wonder people froze to death in them. Add to that the vermin and the sickness and the malnutrition (1500-1700 calories per day for hard labour work). Even the fuel for the stoves in the barracks was rationed. Then the toilets – even here about 250 people at a time were forced to do their daily business using a hole in a concrete platform in 2-3 minutes. Then they were forced off and had 2-3 minutes (5 minutes for everything) at a communal sink to wash. Efficient but inhuman. 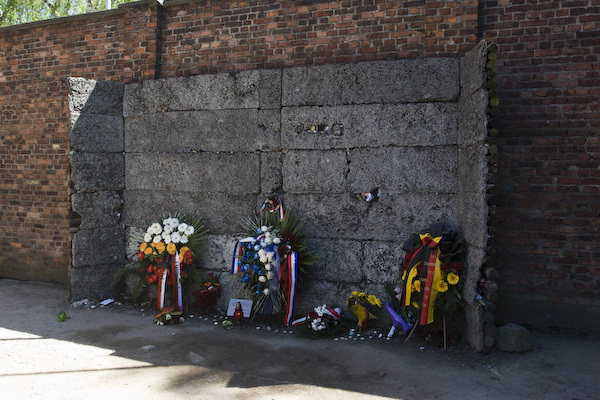 After that we had another short bus ride back to Auschwitz I and the tour was over. After a drink Isabel and I wandered through the camp on our own. We went into a building that we had not been to on the tour. It contained an exhibition about the German occupation of Poland and other eastern European countries. Among the historical exhibits were a number of shocking photographs. The first was a large one of a number of Polish citizens being executed by firing squad. Most of the people being executed were facing away from the firing squad and had black bags/sacks over their heads but one didn’t. He was half turned looking at the shooters. And at me. even though the photograph was fuzzy it was very powerful. In another photograph there are a row of people hanging from a gibbet. In front of them there are some soldiers (I presume SS) that are laughing and joking apparently – again shocking. In yet another photograph there were the corpses of three babies – terrible and inhumane. But, for me, the most terrible symbol of the whole thing was of a woman holding a baby turned and running away from a soldier who had a rifle pointing at them. They seemed to be no more than five feet away. So very very sad. In conclusion something that Isabel said comes to mind. 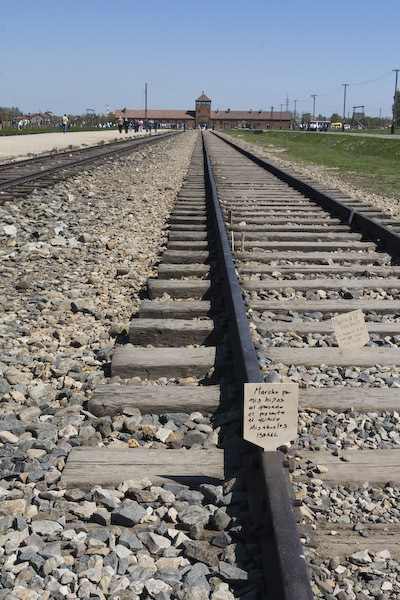 When surveying the many visitors to Auschwitz I she said “How many people enter this place and can leave again” to which I can only add “how many people entered this place never to leave again”. First of all a human being then everything else!